Let's share about active citizenship - Stowarzyszenie Młodzieżowych Inicjatyw Twórczych "CREATOR"
SMIT "CREATOR" members were participating in a YE titled Let's share about active citizenship co-ordinated by IKJA e.V. and held in Hannover, Germany. „Active citizenship” with this motto on 12 August 2013 I began my one-week journey in Hannover , Germany. In this journey apart from me take part 4 participants from Poland and groups from Germany, Bulgaria, Romania and Italy. During this Youth Exchange I have a chance to see different civil initiatives held in countries involved in the project. Besides exchanging of ideas, we have met stereotypes that still exist in our countries, tried to understand an idea of being active locally and globally as well as we suggest our own actions. I must admit that participation in those workshops was an inspiring and interesting experience for me. What’s more, our stay was varied by the trip to Bremen instead of planned visit to Berlin, however, it favourably surprised all participants. 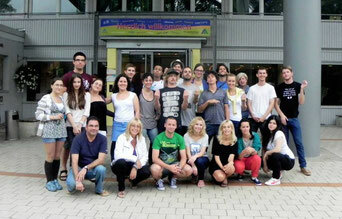 From 12 to 19 August 2013 the group of five took part in a project on active citizenship, held in Hannover, Germany. We discussed what is an active citizenship; became familiar with the Ubuntu philosophy; debated a social media role in building peoples’ attitudes and influencing their mindsets; considered the assumptions by adopting the Iceberg model, etc. We had time to explore Hannover and Bremen, each with specific climate making them the unique cities. The group consisted of 25 participants, who were highly motivated, enthusiastic and sharing ideas people. We learnt a lot from each other. Youth exchange in Hanover based on active citizenship was an amazing opportunity to learn not only specification of projects, on european level, but also was closely related to the functioning of the European Union, civil rights, and social participation of young people. It was above all a great field to exchange ideas, thoughts and opinions on issues bothering the society in today's world. During the workshop, people from Poland, Bulgaria, Romania, Italy and Germany have developed a common position on the issues, risks and methods of solving them. As a polish team leader I have taken part in the project “Let's share about active citizenship” held in Hannover, Germany. The aim of this project was to reach a better understanding of the concept of active citizenship, and finding tools for the youth about how to participate actively in civil society. 25 people (5 team leaders and 20 participants) from: Bulgaria, Germany, Italy, Poland and Romania have taken part in the event. In my opinion the best part of the project was the opportunity to share experiences during workshops. It furnished participants with new ideas and gave them a huge amount of positive energy that they needed upon returning to the country of origins in order to implement the best concepts from abroad. Furthermore, a great way to promote our countries and learn about various cultures occurred through so-called “cultural evenings”, during which representatives of each country have had the possibility to make a creative presentation about their country and to share their national food and drinks with the others. My responsibility as a team leader was to organize the trip of the Polish team, to ensure that the program of the Polish cultural evening is exceptional and leaves a good impression of the country, what is more to ensure that the Polish participants’ contribution to the success of the project is significant. I’m particularly proud that thanks to the great efforts of the polish participants, our presentation was exceptionally good.